All pupils in our school and nursery have Glow accounts and as such they can now download for free the Microsoft Office 2016 apps on up to 15 personal devices; up to 5 PCs or Macs, 5 tablets (Windows, iPad and Android) and 5 phones. ‎Making these apps available helps Glow users take full advantage of the opportunities these tools offer. The Office apps which include Word, Excel, PowerPoint and OneNote provide a learning platform that extends beyond school and into the world of work. 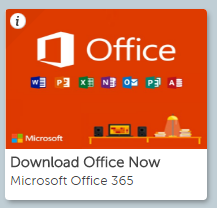 To download the Office 2016 apps, log in to Glow and either click on the ‘Download Office Now’ tile or go to the ‘Office 365 Home’ tile and once in Office 365, click on “Install Office 2016” at the top right of the page. Find out more here. If you need help accessing Glow then please contact the school for assistance.